God loves the impossible. It’s no real secret that He enjoys proving us wrong. Where we say, “It can’t be done,” He just says, “Pshhh, really?” Then a donkey speaks, a prophet beats a chariot on foot, locked shackles and doors pop open with a quick shake of the ground and that’s just a sampling. We tend to see our challenges as absolutes. If it hasn’t been done before, throw in the towel because it’s gonna stay that way. Too hard? Our minds travel to the area of sho-nuff and set up camp. When the impossible came to mind, it took me back to one of my favorite films, The Empire Strikes Back. Now, I have what you call an “obsession” with Star Wars. I can quote each backwards and forwards. My absolute favorite of all is Empire. Personally, I think that it is one of the most complete movies of all time. Anyways, when I thought about the impossible, my mind instantly went to Luke training with Yoda. You can see the clip here. Watch it really quick before reading further. Isn’t that how it goes though? The impossible stares us in the face and we think maybe. But what follows Luke’s doubt is my favorite line ever. I’ve used it so many times in so many situations. Luke goes to war against his doubt and ultimately, his doubt is greater than his faith. 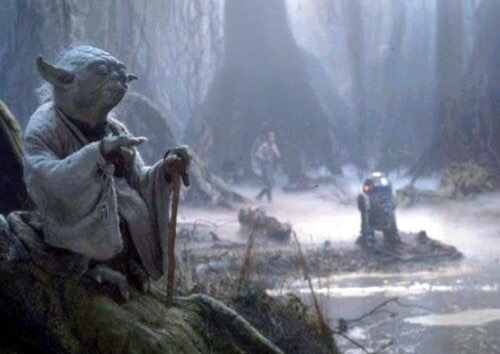 Yoda gives him a long spill on the Force and Luke tells him that he asks the impossible while storming off to sulk. I know you’re probably thinking I’m gonna reference Philippians 4:13, which is very applicable in this situation, but no! This story runs hand-in-hand with Jesus and the disciples on the stormy sea. So, where is your faith? Has your hope been dashed, thus wrecking your faith? Let me tell ya, no situation is too big or small for God to handle. Nothing is impossible with God (Luke 1:37). You faith in His ability just has to outweigh your doubt. But that’s a lot harder than it sounds. Since we live, work, eat, sleep, and breathe in the world, we have to constantly be on our guard. We need to remind ourselves that each day is the day that God has made and we should rejoice and be glad! Lamentations 3:22-24 says that His mercies are new EVERY MORNING. That means every day we get the chance to set the tone with God. By doing that, we align ourselves with Him, therefore giving us the mind of Christ. And His mind is flawless, right? To go even further, if we have the mind of Christ we can push harder and trust that He is able to do exceedingly above whatever we ask or think. Therefore, nothing is impossible. Change your thinking. Get rid of what the world says and start filling up on what God says. That mountain will never be too big, nor will the race be too long. ← Hello!?! This is your calling, calling. Jacob, this gives us all pause a time to change our thinking to Christ’s mind thinking and we can live a better more faith filled more God inspired God’s word telling us what and how to live!! Thank you so much for working so hard on these messages! !